Move aside, food trucks, this is the era of the pop-up. We had heard of these mythical churro ice cream sandwiches, even saw pictures of these elusive treats on social media, but the existence of this epic duo had yet to be confirmed. Until one day, we saw a Facebook post that announced the time and date for the release of a round of tickets to The Churro Borough Pop-Up. “Tickets” are free but, as they represent one of only 300 available slots, were extremely limited. I sat in front of my computer at 9:50am, F5-ing my browser window over and over until the “Buy Tickets” button finally appeared. It was like trying to buy concert tickets back in high school. They sold out in four minutes but Martin and I each snagged a pair of tickets. We were so excited. 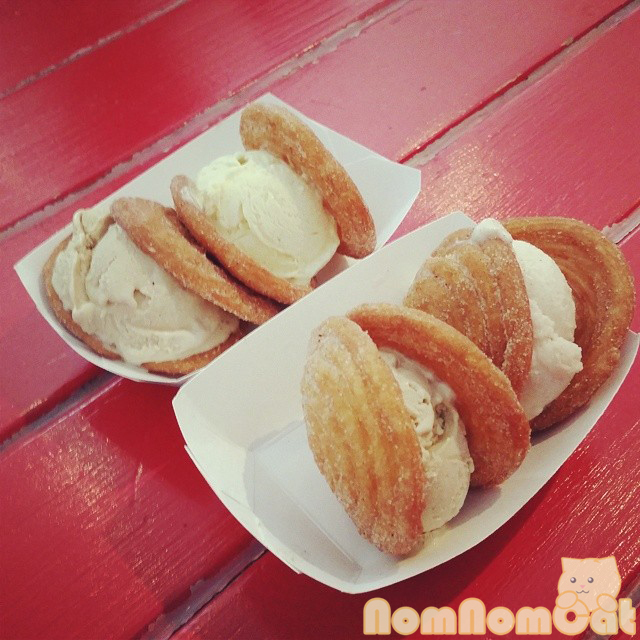 Churro Ice Cream Sandwiches: Spanish Latte x 2, Horchata, Vanilla Custard. That Sunday afternoon, we arrived at the Mexicali Taco & Co. storefront on the outskirts of Chinatown. There was already a long line forming, each person eager to spend $4 a pop on these desserts. We took his parents with us to celebrate his mom’s birthday, and they could not believe that so many young people put in that much effort for this exclusive sweet. When our turn finally came, we each only got one since we had dinner plans shortly after. Mine? Horchata. It tasted like Cinnamon Toast Crunch cereal in the best way possible, though the churro itself could have been crispier. If you want to get one of your own, follow Churro Borough on Facebook for their latest pop-up updates. I don’t know if I would go through all that trouble again, but if they ever purchased a truck or brick & mortar storefront, I would be happy to stop by for a $4 churro ice cream sandwich; this is LA’s new gourmet cupcake and I hope it sticks around for a long time. Come join us this SUNDAY, August 10th at Mexicali Taco & Co! Purchase (FREE) tickets for this pop-up – Limit 2 per customer. Only 250 tickets available! Each admission ticket will allow up to 2 sandwiches per customer. $4 per sandwich. I don’t really understand the point of the tickets. Seems like an unnecessary step. Is it just for hype. Just sell to the first 300 people who turn up and then close shop. Like any other shop.